MAN SE (pronounced [ɛmʔaːʔˈɛnʔɛsˈʔeː], abbreviation of Maschinenfabrik Augsburg-Nürnberg, pronounced [maˈʃiːnənfaˈbʁiːk ˈʔaʊ̯ksbʊʁk ˈnʏʁnbɛʁk] or [-faˈbʁɪk-]), formerly MAN AG (pronounced [ˈman ʔaːˈgeː]), is a German mechanical engineering company and parent company of the MAN Group. 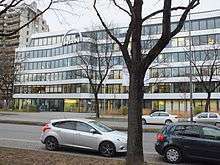 MAN SE is based in Munich. Its primary output is for the automotive industry, particularly heavy trucks. Further activities include the production of diesel engines for various applications, like marine propulsion, and also turbomachinery. MAN supplies trucks, buses, diesel engines and turbomachinery. Until September 2012 MAN SE was one of the top 30 companies listed on the German stock exchange (DAX). The company celebrated its 250th anniversary in 2008. In 2008, its 51,300 employees generated annual sales of around €15 billion in 120 different countries. The company operates through fully owned subsidiaries or joint ventures with local companies in India, Poland, Turkey, China, United States, United Arab Emirates, South Africa, Uzbekistan, Portugal and Germany/Austria. The MAN Group currently operates its production output through three main subsidiaries, with each subsidiary's output destined for different locations. MAN Truck & Bus is one of Europe's leading commercial vehicle manufacturers. MAN Diesel & Turbo is a world leader in large diesel ship engines, stationary engines and turbomachinery. MAN Latin America has a leading position in heavy trucks in Brazil. During 1921, the majority of M.A.N. was taken over by the Gutehoffnungshütte Actienverein für Bergbau und Hüttenbetrieb, Sterkrade (GHH), (founded 1873). Through well-directed equities and acquisitions of processing industries, e.g., Deutsche Werft (1918), Ferrostaal (1921), Deggendorfer Werft und Eisenbau (1924), MAN advanced to a nationwide operating enterprise, with a workforce of 52,000 by 1921. At the same time the GHH’s economic situation worsened. The causes for this were, among others, the reparations after World War I, the occupation of the Ruhr region and the world economic crisis. In only two years the number of the MAN employees sank from 14,000 in the year 1929/30 to 7,400 in 1931/32. While the civil business was largely collapsing, the military business increased with the armament under the national socialist regime. GHH/MAN enterprises supplied diesel engines for submarines, tanks (Panzers), cylinders for projectiles and artillery of every description. MAN also produced gun parts, including Mauser Karabiner 98k rifle bolts. Their Waffenamt code was WaA53, and ordnance code was "coc". After the end of World War II the allies split up the GHH group. A vertical integration in which mining, iron and steel production are consolidated was not allowed any more. The “Gutehoffnungshütte”, together with the MAN firms of Southern Germany, therefore concentrated on engineering, plant construction, commercial vehicles and printing machines. This process has been supported by strategic acquisitions and dispositions; one of the most important was the take-over of the truck and bus division of the commercial vehicles manufacturer Büssing (1971), the disposition of the shares of the shipyard Deutsche Werft (1966/67) and the acquisition of the printing machine producer Faber&Schleicher as well as its fusion to MAN Roland Druckmaschinen AG (1979). In 1982/83 the “Gutehoffnungshütte” plunged into a deep corporate crisis. The enterprise suffered from the late effects of the second oil crises and a bad economic situation. This was particularly displayed by the dramatic downturn of the commercial vehicles sales figures. Besides external factors, the chief course of these problems was the obsolete company structure with extensive cross-subsidisation between the divisions. At this time the former director of GHH presented a reclamation concept that envisioned a complete consolidation of the subsidiary with the holding company. This concept encountered great resistance with GHH's major shareholders Allianz AG and Commerzbank. The media speculated about a “Bavarian conspiracy” against the Management in Oberhausen. Rudolf Rupprecht repelled a takeover attempt in 2003. 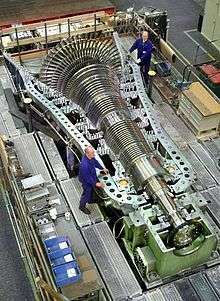 Furthermore, the disposition of the 50-percent share of the SMS Group and the strengthening of the turbomachinery division through the takeover of Sulzer Turbo induced MAN’s focusing process. In September 2006, MAN produced an offer for the take-over of the Swedish competitor Scania AB. The European Commission approved the takeover on December, 14. Nevertheless, MAN voluntarily withdrew the offer on January 23, 2007, after Scania’s major shareholders Volkswagen AG and the influential Wallenberg family had declined the offer. On December 24, 2008, MAN published to possess further stock options of Scania and to therefore maintain more than 20 percent of the voting rights. In 2008, the MAN group celebrated its 250th anniversary with numerous events, like exhibitions in several museums, a vintage car tour with the motto “MAN on the road again” and a great anniversary gala. At the beginning of December 2008 MAN took over the company VW Truck and Bus Brazil and changed the firm’s name to MAN Latin America. Therewith, MAN now is market leader in Brazil with a market share of 30 percent. In 2009, investigators of the Munich Prosecutor's Office uncovered a corruption affair, in which MAN had been bribing business partners and governments in over 20 countries during the years 2001 to 2007, in order to get large orders for buses and trucks. MAN CEO Håkan Samuelsson and further Board Members had to resign. The board of directors appointed Dr.-Ing. Georg Pachta-Reyhofen, the former CEO of MAN Diesel, as successor. On December 17, 2009 Pachta-Reyhofen was assigned as speaker of the board and CEO of MAN SE by the board of directors. Manufacturers of special gears, components of propulsion technology and test systems. Hong Kong-based subsidiary of Sinotruk. 1 2 3 4 5 6 7 "MAN SE - The MAN Group's History - Industrial Pioneering". MAN SE. MAN.de. Retrieved 23 November 2009. 1 2 3 4 5 "Annual Report 2010" (PDF). MAN Group. Archived from the original (PDF) on 12 August 2011. Retrieved 3 April 2011. ↑ "MAN SE Annual Report 2013" (PDF). Man Group. April 2013. Retrieved 28 April 2015. ↑ "Chapter V: Group Management Report" (PDF). MAN AG Annual Report 2008. MAN AG. 2008. p. 73. 1 2 3 4 5 "MAN Group Overview". MAN SE. MAN.de. Retrieved 23 November 2009. ↑ "金华青年曼汽车有限公司". Yo-man.cn. Retrieved 2010-07-20. ↑ "陕西汽车集团有限责任公司". Sxqc.com. Retrieved 2010-07-20. ↑ "Shacman Motors Middle East Sales & Service Center". Shacman.cn. Retrieved 2010-07-20. ↑ "SHAANXI AUTOMOBILE GROUP CO., LTD". truckshacman.com. Retrieved 2013-12-12. ↑ "De Haan". Dehaans.co.za. Retrieved 2010-07-20. ↑ "AK Uzavtosanoat - Toshkеntda an'anaviy yarmarka o'tkazildi". Avtoolam.sarkor.uz. 2010-06-19. Retrieved 2010-07-20. ↑ "MAN Nutzfahrzeuge - en". Militarytrucks.man-mn.com. Retrieved 2010-07-20. ↑ "MAN Truck & Bus". www.man.eu. MAN SE. 2014-01-12. Retrieved 12 January 2014. ↑ "Annual Press Conference - February 14, 2012" (PDF). MAN SE. Retrieved 2012-02-22. ↑ "MAN becomes a European stock corporation". www.man.eu. MAN SE. 2009-05-26. Retrieved 17 December 2009. 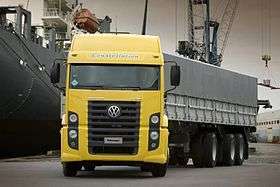 ↑ "VW motors ahead with MAN-Scania truck merger plan". Reuters. May 31, 2011. Retrieved August 16, 2011. ↑ "VW Moves on Trucks". Wall Street Journal. July 5, 2011. Retrieved August 16, 2011. ↑ "VW Claims Victory". 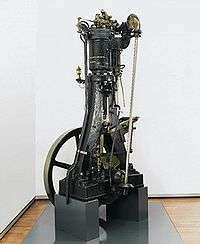 Commercial Motor. 2011-11-27. Retrieved 2011-11-28. ↑ "Volkswagen hikes majority stake in truckmaker MAN". 2012-04-13. Retrieved 2012-05-10. ↑ "Volkswagen Group increases its share of voting rights in MAN SE to 75.03 percent". 2012-06-06. Retrieved 2012-06-06.